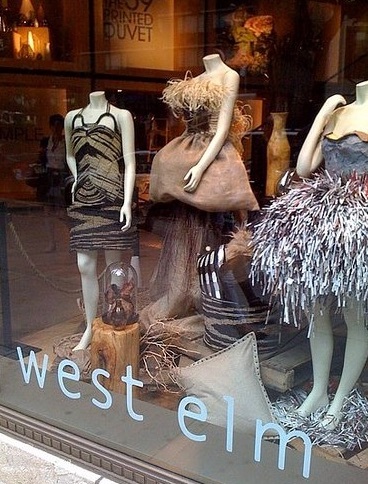 Can Window Displays Reflect the Soul of a City? Window displays are one of my favorite holiday traditions. Though not comparable to New York’s 5th Avenue, I have recently admired the displays of West Elm that line Austin’s own 5th Avenue (or rather street). The scenes reflect the holidays but more importantly the look of an Austin Christmas, which had me wondering how much other shops match the ‘look’ of a particular place. Though I don’t doubt the intuition of each store’s decorators, there seems to be a bit more strategy behind window dressing. According to Comscore, online retail has jumped 16% in the last year, and luckily, West Elm is well positioned to ride this trend. Their sales split 50-50 between in-store and online. This blended approach reflects an important company insight: While “a large share of their purchases originate in-store [they are often] completed online” (Fortune, 2014). However, West Elm is by no stretch original in arriving at this conclusion. What makes West Elm different is the implementation of local tastes. The company learned from trial and error, that regional preferences are often indicated from online sales but best reflect at their brick and mortar locations. For instance, when opening a new shop in the college town of Durham, North Carolina, West Elm “expect[ed] a younger shopper, seeking a contemporary look” (Fortune, 2014). When sales lagged, the company consulted online purchases tied to zip codes and discovered that Durham shoppers actually preferred traditional pieces. The company suspects that the “state’s role as the birthplace of American furniture,” (Fortune, 2014) might explain this surprising preference. What an interesting conclusion. Of course a city’s taste is driven in part by geography, culture and tradition, but how much of theses preferences can be indicated by online sales? I suppose one could argue that in many instances online shopping is unique to each customer, but locally conscious displays represent collective preferences, driven by seemly immeasurable factors. I guess only time will tell how well numbers can decorate our cities.